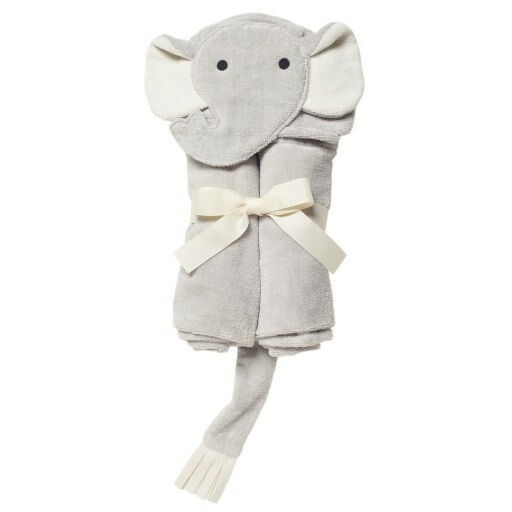 Give an adorable elephant bath wrap as a baby gift at your next baby shower from Elegant Baby! This precious hooded bath towel is a special gift for baby! Featuring a cute elephant design, this comfy bath wrap is made of 100% cotton velour terry with cotton terry back. Keep baby cozy and dry in this soft plush baby bath wrap. Elegant Baby has spent over 40 years producing beautiful gifts for beautiful babies. Through the years, Elegant Baby has embraced technological advances and opportunities, but has always held on to core values such as quality and style. Add a personalized cable knit jumpsuit or delicate silver plated rattle to complete your elegant baby. When browsing Elegant Baby gift products, you will be sure to find classic baby gifts and keepsakes that will be cherished by your baby for years to come!